THE Bank of Ghana (BoG) has banned 125 people from opening and operating current accounts with any bank in the country over the next three years. It follows their persistent issuance of dud cheques, popularly called bounced cheques, to banks and rural banks. The central bank has subsequently directed all banks to return any deposits in the current accounts of the affected people and close down their accounts with immediate effect. The directive was contained in a November 2 circular sent to all managing directors of banks. In spite of banning the affected people from operating current accounts, the circular said they could open and operate savings accounts with the banks. The BoG further advised the banks to ensure that the affected people, whose names, type of identifications (IDs) and ID numbers were included, pay off any indebtedness to their bankers. 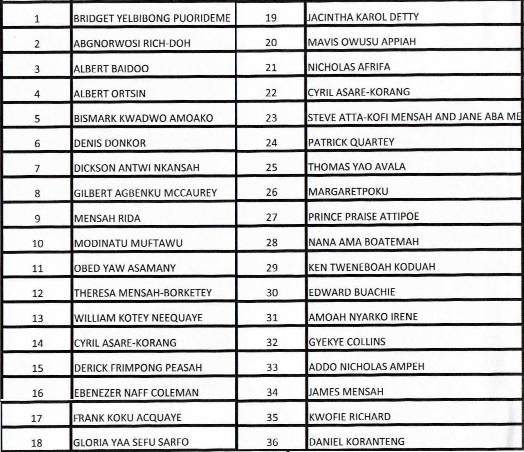 “The attached list of individuals have persistently issued a number of dud cheques to some banks and rural banks. “In accordance with the BoG’s notice No. BB/GOV/SEC/2005/5 (SANCTIONS FOR ISSUANCE OF DUD CHEQUES), you are directed to debar or cease them from operating current accounts for three years with immediate effect. These individuals may, however, be allowed to operate savings accounts,” the circular said. A banking consultant, Dr Richmond Atuahene, praised the action as positive and necessary to restore trust in cheques in the country. He said unlike elsewhere, where cheques are valued as much as cash, confidence in cheques issued in Ghana was dropping due to persisting ‘bouncing’ whenever the payees presented them. “This rule has been there since 2007 but they really have not applied it. Now if they are doing ‘name and shame’, then the whole world will know that we are now serious about our cheques. “Other than that, it will get to a point when if you give someone a cheque, he/she would prefer cash because it may bounce,” he said. He advised the BoG to go a step further to publish the names in the newspapers to serve as a further deterrence. He added that credit reference bureaus should also use the data to downgrade the credit worthiness of those found culpable. Dud cheques are cheques that are drawn on bank accounts that have insufficient funds to meet their face values. The Credit Reporting Act, 2007 (Act 726) makes it compulsory for banks and other deposit-taking institutions to report such incidents to credit reference bureaus in the country. The banks are also mandated to notify the BoG of customers whose cheques have bounced for onward submission to the BoG. A source at the central bank told the Daily Graphic in confidence that BoG’s regulations required that account holders who issued dud cheques on three consecutive times be blacklisted from owning and operating current accounts. It added that the current action was taken on cheques that were drawn in the third quarter of this year. It said the bank would ensure that banks carried out the directive to serve as a deterrent to other bank customers. In recent times, the BoG has stepped up efforts to cleanse the banking system of the issuance of dud cheques as part of a broader effort to instill trust and confidence in the financial sector. Issuance of dud cheques hit a four-year high in 2016, rising from 34,389 in 2014 to 55,665.